Ultrasonic dispersion is the superior method to blend C60 homogeneously into a stable oil-based supplement. The mild, precisely controllable ultrasonic treatment ensures that the C60 molecules are kept intact for best results. The ultrasonically blended nano-structured formulation results in optimal bioavailability of C60. C60 oil has been shown to elongate rats’ life span by approx. 90%. The life-prolonging effect of C60 is its ability to quench various free radicals, acting as a free radical scavenger. For oral administration, C60 powder must be dissolved in a high-quality food-grade oil such as olive, linseed, avocado or coconut oil. For high bioavailability, the encapsulation in liposomes (nano-sized lipid carriers) is required. C60 molecules are known for their extremely low water solubility, but even when C60 is mixed into vegetable oil it does not have a good bioavailability. This makes it a demanding task to formulate a supplement with the desired life-prolonging effects. To overcome the problem of lacking bioavailability, the C60 molecules must be encapsulated into liposomes. Ultrasonic emulsification is a well-established efficient technique to form nano-droplets and liposomes. C60 in liposomal form has superior bioavailability. C60-loaded liposomes are even water-soluble so that the C60-liposome complex can be processed further into water-based final formulations. 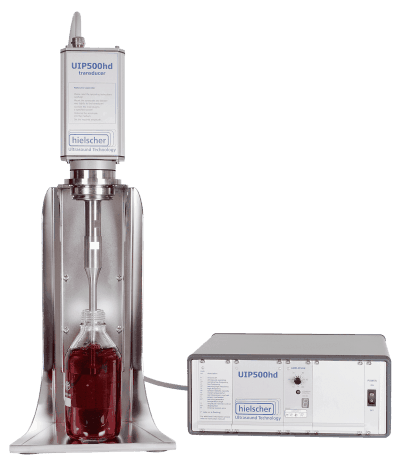 Click here to learn more about the ultrasonic liposome preparation! C60 oil is has gained lately a lot of attention since the supplementation of C60 in rats has increased the rats’ life span by spectacular 90%. The outstanding effect of Carbon 60 (C60) on longevity is mainly caused by its superior antioxidant action. C60 oils act as free-radical sponge – scavenging reactive oxygen species (ROS) so that they cannot harm by damaging healthy cells. Thereby, inflammation, ageing and the development of desease can be prevented. A further explanation of C60 fullerenes’ life-prolonging effect is its possibility to act as mitochondria protonophore and various simulations of the transport of C60 and its hydroxylated and other derivatives through lipid bilayer membranes, which can account for scavenging capacity of fullerenes for reactive oxygen species and their acting as mild mitochondrial respiration uncouplers. Hielscher Ultrasonics is your top supplier for powerful and reliable ultrasonic processors. 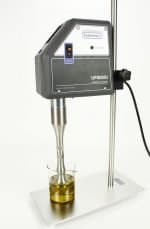 Whether you need a compact device to produce smaller batches or you want to manufacture large quantities of C60 oils, Hielscher’s product range offers the suitable ultrasonicator for your requirements. Baati T.; Bourasset F.; Gharbi N.; Njim L.; Abderrabba M.; Kerkeni A.; Szwarc H.; Moussa F. (2012): The prolongation of the lifespan of rats by repeated oral administration of fullerene. Biomaterials 2012. 1-11. Galvan Y.P. ; Alperovich I.; Zolotukhin P.; Prazdnova E.; Mazanko M.; Belanova A.; Chistyakov V.(2017): Fullerenes as Anti-Aging Antioxidants. Curr Aging Sci. 10(1); 2017. 56-67. Markovic, Z.; Trajkovic, V. (2008): Biomedical potential of the reactive oxygen species generation and quenching by fullerenes (C60). Biomaterials 29/26; 2008. 3561-3573. Nichita, C.; Stamatin, I. (2013): The antioxidant activity of the biohybrides based on carboxylated/hydroxylated carbon nanotubes-flavonoid compounds. Digest Journal of Nanomaterials and Biostructures Vol. 8, No. 1; 2013. 445-455. Prylutska S.V. ; Burlaka A.P. ; Prylutskyy Yu.I. ; Ritter U.; Scharff P. (2011): PRISTINE C60 FULLERENES INHIBIT THE RATE OF TUMOR GROWTH AND METASTASIS. Experimental Oncology 33, 3; 2011. 162–164. Pharmacokinetic studies in rats have shown that dissolved Carbon 60 is absorbed via gastro-intestinal tract and eliminated in a few tens of hours. C60 is one form of buckyball cluster. The smallest member of buckyballs is the C20, which is an unsaturated version of dodecahedrane, whilst most common buckyball type is C60. The fullerene C70 is a another very common type of larger buckyball and even 72, 76, 84 and even up to 100 carbon atoms are commonly obtained as buckminster fullerenes. The structure of C60 is often associated with the structure of a soccer ball. C60 is a truncated icosahedron, made of twenty hexagons and twelve pentagons, with a carbon atom at the vertices of each polygon and a bond along each polygon edge. 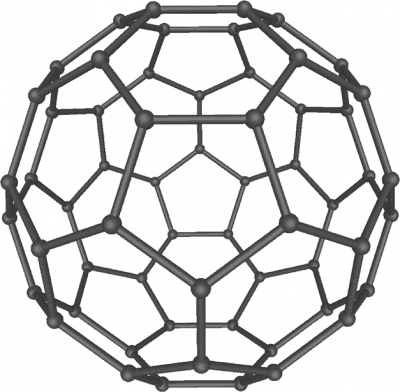 The van der Waals diameter of a C60 molecule is about 1.1 nanometers (nm). The nucleus to nucleus diameter of a C60 molecule is about 0.71 nm. The C60 molecule has two bond lengths. The 6:6 ring bonds (between two hexagons) can be considered “double bonds” and are shorter than the 6:5 bonds (between a hexagon and a pentagon). Its average bond length is 1.4 angstroms. The investigation of the precise effects of C60 in cells and the human body is yet in its early stages. So far, researchers suggest that C60 affects mostly the mitochondria in cells. Mitochondria are known as cellular power plants, generating energy in the form of adenosine triphosphate (ATP) through the process of respiration. With increasing age, the performance of cells and mitochondria tend to slow down and to work less efficiently. With decreasing cell metabolism, free radicals and toxins accumulate in the cells. This build up of oxidized material is most likely one of the main causes of aging. Research studies let assume that C60 molecules are able to penetrate the mitochondria membrane and bond with free radicals, facilitating their excretion as cellular waste. This increases the overall efficiency of the metabolic process and enable the cells to fulfil its tasks properly. Furthermore, it is suggested that C60 Fullerenes, which have been dispersed in olive oil, act possibly as an adaptogen. Adagtogenic substances induce homeostasis, which makes cells less susceptible to stress. Liposomes are microscopic spherical vesicles, which can be artifically prepared, e.g. by sonication. These vesicles are an important form of drug delivery since their amphiphilic property makes them affine to both aqueous and polar moieties. This amphiphilic property is caused by the hydrophobic tail and a hydrophilic or polar head which liposomes are built from. Due to this characteristic, liposomes are widely used as a vehicle for administration of nutrients and pharmaceutical drugs. Liposomes can be prepared by disrupting biological membranes. A popular and effective method for the preparation of liposomes is ultrasonication. Liposomes are composed of biocompatible and biodegradable material, which makes it a very safe drug carrier.